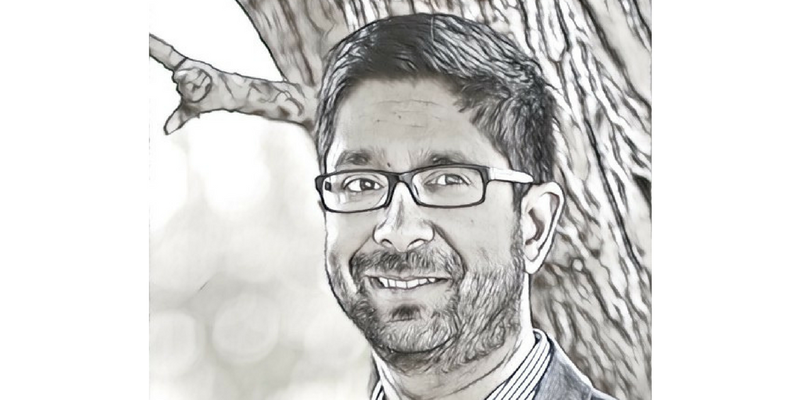 An interview with Vijay Pande on his new biotechnology fund at Andreessen Horowitz. The magic of medicine, says Vijay Pande, has long been epitomized by things like antibiotics: you get an infection that would have killed you a century ago, take some pills, and you’re fine. But, he says, we’re about to move into a new era: Doctors will soon be detecting conditions much earlier than they can currently, and they’ll be prescribing not only drugs, but behavior change — all enabled by artificial intelligence. Pande is in a unique position to see this future, having founded a $200 million biotechnology fund for Andreessen Horowitz, the high-powered Silicon Valley venture firm that he joined in 2015. The Bio Fund invests in companies at the intersection of biology and technology, and already includes Freenome, which aims at the early detection of cancer; Cardiogram, which targets heart disease, and Omada Health, which uses software-based coaching to help people lead more active lifestyles and ward off lifestyle diseases like type 2 diabetes — with peer-reviewed, formally studied results. Pande was previously the head the Stanford computational biology lab that bears his name, which he now advises. He also founded [email protected], which was awarded the Guinness World Record for the largest distributed computing cluster in the world. It uses tens of thousands of volunteers’ idle resources in computers and video game systems to study how proteins form — or “fold” — with research impacts ranging from Ebola to Alzheimer’s to breast cancer. In what is the first in a series of interviews with New Pioneers funding the health care revolution, Thrive Global spoke with Pande about his new fondness for talking via robot, the promise of computer-based therapy, and why artificial intelligence will be crucial for curing cancer. THRIVE GLOBAL: What trends in health are you most excited about? Vijay Pande: My favorite is where machine learning is ushering in a new era of prevention. Typically, prevention is your doctor telling you to eat better or exercise. What we’re seeing is a radically different approach. In companies like Freenome, a blood sample tells us that you have early stage cancer, potentially stage 0 or stage 1. You could get surgery or pharmaceutical therapy. In those cases, the success rate often is extremely high, 80 percent plus — in some cases approaching a hundred percent. Usually people are thinking that the cure to cancer is some pill they’re going to take that cures all cancers. And that’s just not how cancer works. Cancer is a mix of many diseases. On top of that, we already have a lot of pills for cancer. The missing link in this cure, I think, is the ability to catch it early. Catch it at a stage where you can expect to be successful. This is really only possible with machine learning creating prevention. TG: Machine learning, where algorithms learn through studying data sets, allowing computers to do things that we don’t know how to program them for. VP: Really great doctors have seen so much, they’ve developed this intuition — machine learning has a lot of that. This intuition of the doctor’s is not irrational. It’s a set of conclusions drawn from seeing so much evidence, such that you can pick up the nuances, and we’re seeing something similar with machine learning. TG: It’s like how no one knows how to program a self-driving car: Google Car learned by observing people driving. Given the right data set, algorithms can devise their own understanding. VP: We’re seeing that in other cases. One of our portfolio companies, Cardiogram, is using data from wearables and machine learning to give you an early heads-up to see if you have issues with heart disease, such that you don’t have to wait for a heart attack to know that you have a serious problem. It’s immediately having an impact in fields where images are involved. Computers can do better in recognizing images than typical human beings can. Any medical area inherently driven by images, we’re seeing the potential for computers to not just be comparable to doctors, but to exceed the performance of doctors. That’s what came out in this dermatology paper in the journal Nature — that the AI was doing better than the typical dermatologist. TG: We’ve been talking about the future a lot. From the consumer perspective, are there any tools or technologies available that you’re incorporating into your own life today? VP: In terms of communications, on the phone, you’re sort of this disembodied voice. But telepresence robots, like the Beam Robot, let you turn around, look at people, have a sense of things — it has the feeling that you’re physically in the room. You’re talking, you can move. It’s funny how quickly you adapt and not realize that that person isn’t really there, in a way that you don’t get on the phone. That’s part of how we do a lot of our business. Communication isn’t just the transcript or the inflection of my voice, but my body language and watching everyone else’s. You could imagine one step above would be doing conferences in VR, you feel like you’re in the same place, like the Jedi Council meetings in the early Star Wars. I try to encourage my collaborators who don’t live close to have them as standard, and they’re getting relatively inexpensive. TG: That brings us to another subject we’re interested in at Thrive — our relationship with technology. You’ve talked about how technology can be used to change people’s behavior to more healthy lifestyles, as a method of preventative medicine. I’ll read your words back to you: “I’m confident that 10 to 20 years from now, when we look back on this phase of medicine, it’s going to seem backwards and even barbaric that our solution to everything was just giving out pills.” What do you mean by that? VP: There are areas of medicine in which, no doubt, pharmaceuticals are the natural plan A. My favorite example is the antibiotic. There are few things that have the magic that we associate with medicine like an antibiotic, where a hundred years ago you have a bacterial infection and you die. Now you have the same bacterial infection, you take a pill a day, and in a week you’re perfectly better. That’s a collective feat that we, as humanity, should pat ourselves on the back for. But that plan A only works for certain things. Maybe antibacterial, antifungal — these are areas where we know how the biology works, where it’s easy for drugs to kill something or stop something. Cancer drugs kill cancer tissue, but it’s very hard to heal. For an issue that’s behavioral in nature, like type 2 diabetes, anxiety, depression or PTSD, this isn’t something where the biology is so well known that you can come up with a drug and just nail it — kill the protein or the bacteria and just move on. The irony is there are existing solutions that are behavioral in nature, based in therapy, especially cognitive-behavioral therapy. The issue is these programs are expensive and hard to scale, so the question is: Can we work to make them scale, and bring them to millions of people, not tens of people, and at a reasonable cost? TG: Some will say that computerized mental health care misses out on the relationship between the therapist and the patient or client, and that’s where a lot of the healing happens. VP: There are many types of therapies. Some have the modality which you describe, that it is more of a relationship. I would say the first question should be, which therapies have the greatest efficacy? Cognitive Behavioral Therapy has been tested. In studies of depression, different types of therapy have been compared, and the leading therapy is cognitive behavioral therapy. What’s even more intriguing is computational cognitive behavioral therapy. When CCBT has been included in the comparison, CCBT comes out on top. I think we’re used to certain things we like about therapy, but there’s a lot of things we don’t like. Typically, these things are once a week, and they are in person, which can be kind of intimidating. There is an interesting and powerful appeal to the asynchronous texting that a lot of CCBT invokes. It is a little more anonymous and more immediate. Those two combinations, the data has suggested, can be very powerful in improving efficacy. TG: How could this new technology play a role in therapy in the future? VP: What is intriguing — and I’m not referring to any specific company as much as a fantasy company — I could imagine a company that starts with human therapists. In terms of the quality, some are better therapists than others. Even with the same level of quality, there’s a match issue. Some therapists would be a great person for me, but not for somebody else. You could imagine using the computational approach to handle the logistics, to make sure you get the best therapist for you. Even in extant modalities, what’s intriguing is if you have a couple years of that data set, imagine what machine learning could do, in terms of learning, on that data set. Maybe it could get good enough to be the first line of defense here. It’s hard for me to imagine someone saying I feel suicidal and having a machine ready to handle that right now, or anything significant clinically like that. At least, for the foreseeable future, I would want to see it escalated to a human being. The potential here is for making not just a therapist, but creating the best possible therapist you could ever have, based on the data inputs we’ve seen — like with dermatology, we don’t just create a dermatologist. As you get more patients, and get more data, the therapist gets better and better.